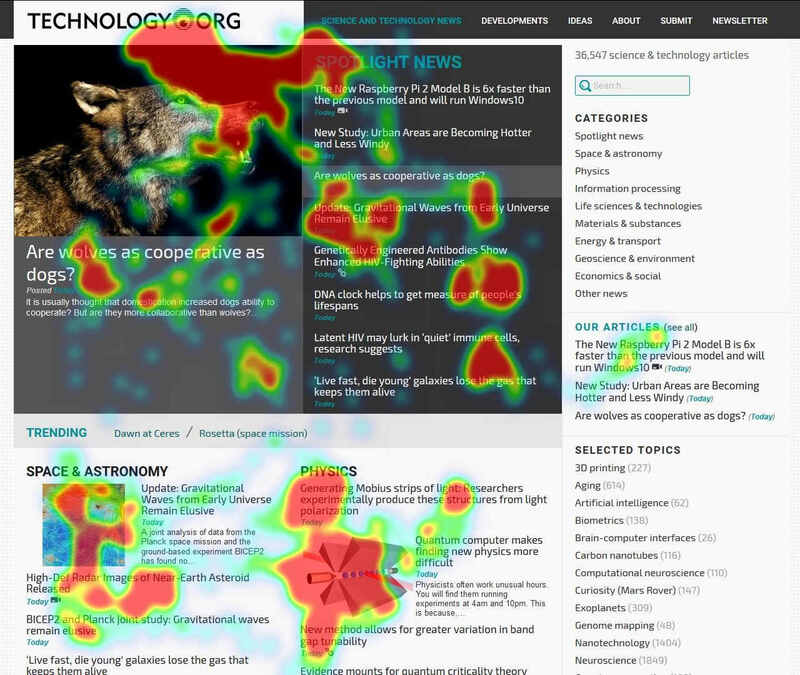 Heat map generation and other gaze-based statistics for single and multiple subjects. Application control with user's gaze as a pointer. Calibration to screen size and distance from screen. Compatibility with other Neurotechnology products like face biometrics SDK. advertising research for both TV and static ads (posters, product placement etc). Medical and scientific research which needs to detect and track subject's eye movement. Real-time gaze tracking. 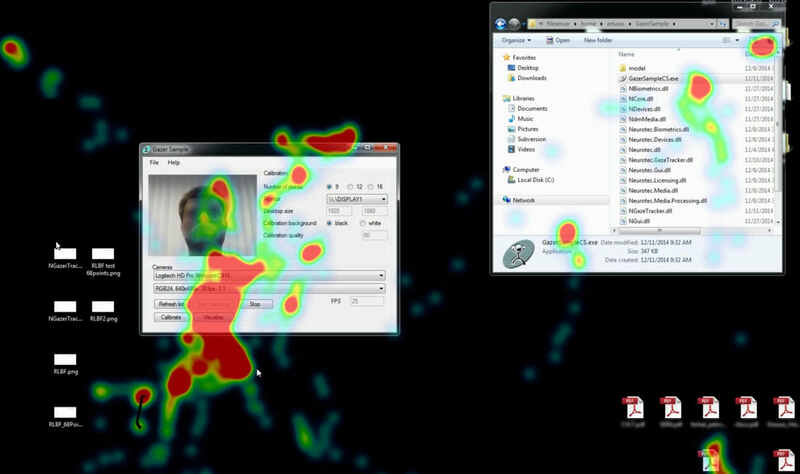 SentiGaze tracks user's gaze and provides results in real time. The gaze tracking session can be also saved for future use. Heat map generation. 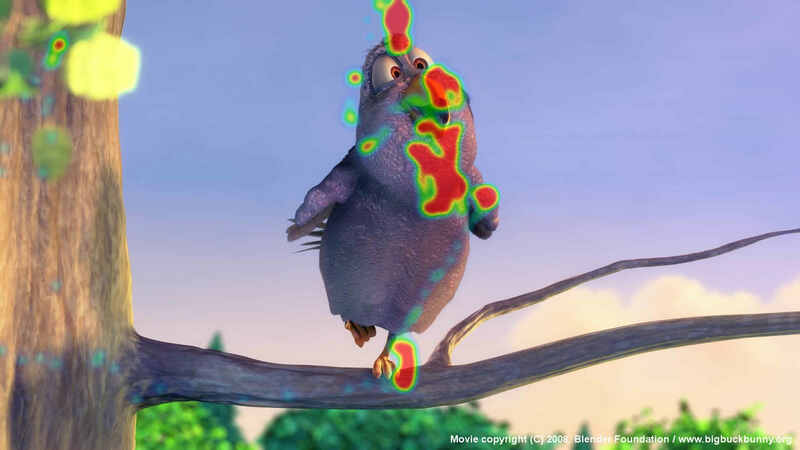 Gaze tracking session can be represented as a heat map which can be generated on top of screen contents like web pages, applications, static images or videos. Live preview of the heat maps is available. SentiGaze generates heat maps for single subjects and can also merge individual heat maps for multiple subjects gaze statistics. Application control. SentiGaze functionality can be used for enabling computer, device or application control using gaze as a pointer. The possible applications may range from gaze-controlled software to additional input method for computer games. Accessibility. Specialized software for disabled people can be developed to provide gaze-based control where other accessibility options are not suitable. Simple usage. SentiGaze technology is designed to work with regular webcams and requires no special hardware like specialized gaze-tracking cameras or fixing person's head in a rigid position. Proprietary algorithms are used to detect subject's eyes on the captured video and track their movement. No physical contact required at any stage of gaze tracking. Adaptive to screen size and distance from screen. A simple short procedure calibrates SentiGaze for specific environment before gaze tracking session. Users are guided to fix their gaze at several points on the screen during the calibration procedure. Compatible with other Neurotechnology products. SentiGaze can be used with other Neurotechnology products for applications which require additional biometric data. For example, biometric algorithms from VeriLook SDK can be used to determine subject's gender and detect emotions, or even identify a previously enrolled subject.